Activity in Ontario on 24 GHz is starting to increase. This article provides a guide on how to join this activity and what to expect. The frequency allocation is as shown in the following table, along with the other services that share this band in Canada. Unlike some of the microwave bands, this band is available worldwide. There really isn't heavy usage by the other services at present, except for the unlicensed ISM equipment in the form of low power radar burglar alarms and door openers. Parts for this ISM equipment have become available as surplus, helping amateurs to get started. The propagation characteristics at 24 GHz are quite similar to the lower microwave bands in most respects. That is to say that the most useful propagation is line-of-sight, with occasional enhancement by Tropospheric bending and ducting, and perhaps some Tropospheric scattering with the best available equipment. I've not seen any claims regarding rain or snow scatter, but I suspect it is possible with good equipment. However, there is one significant difference, which is that the 24 GHz band falls near the centre of a band which suffers from absorption by water vapour molecules in the atmosphere. This provides an extra challenge for those trying to cover distances of more than a few kilometres. The following graph shows the losses which can be expected through air at different temperatures and with relative humidities from 10 to 100%. Since air can hold more water at high temperatures the losses increase with temperature as well as with relative humidity. Thus while line-of-sight paths are the ones we try when starting out, they usually require portable operation. But during the summer in southern Ontario, when we like to be outdoors, it is usually both hot and humid which leads to high losses. For example, from the graph one can see that at 27 degrees and 80% relative humidity the loss is 0. 5 dB per kilometre. So over a line-of-sight path of 50km an extra loss of 25 dB must be dealt with. Tropospheric ducting and refraction which can extend the paths beyond the horizon rely on variations of the refractive index of the air due to its water content, and can become more pronounced if the humidity is high. So in order to get a long path we need to put up with lots of path loss !However, the challenge is not insurmountable as shown later by some examples of what can be done. If nothing else it provides an incentive to do some microwave operating in the winter when both lower temperatures and lower relative humidities prevail. That same 50 km path at 0 degrees and 40% relative humidity suffers only about 0. 05 dB/km loss or 2. 5 dB in total. So this path could be done on a typical winter's day with 22. 5 dB less power (a factor of nearly 200 times less) than in July. narrowband modes (CW and SSB voice) which are used exactly as on the VHF bands, i. e. upper sideband for voice, on-off keying for code, single frequency simplex operation using horizontal polarization. So far, I know of no narrowband activity in Canada with the exception of VE4MA's 24 GHz moonbounce efforts. For the builder of equipment WBFM gear is much cheaper in parts and easier to get going. If one is interested in commercial gear, however, a transverter for narrowband operation is actually cheaper than a full WBFM transceiver, if the cost of the 144 MHz transceiver that the transverter works with is not included in the comparison. On wideband FM, VE3's OIK, VXO and SMA are active. VE3EZP is working on equipment and W2EV quite often operates from the Canadian side of the Niagara frontier. I understand that VE6KKZ and VE6TC also have wideband gear for 24 GHz. There is also some activity in the Rochester, NY area (certainly on wideband FM, possibly also narrow band) and in Michigan (primarily narrow band). In some areas of the world, FM television is used on 24 GHz. Denmark probably has the most enthusiastic 24 GHz TV operators. Equipment for wideband FM is all based on variations of the "Gunnplexer" concept initially popularized for 10 GHz by M/A COM. These use a 24 GHz Gunn diode oscillator as a transmitter and simultaneously as the local oscillator for the receiver. The oscillator is frequency modulated for transmission. The receive frequency is offset from the transmit frequency by the intermediate frequency used. In North America, an IF of 30 MHz is standard for 24 GHz operation. The Gunn oscillator frequencies used are near the centre of the band, around 24. 125 GHz. Transmitter powers vary typically from 5 mW to 200 mW. The following block diagrams show some of the possible versions. The first is the simplest, which employs a Gunn oscillator/mixer unit as typically used in alarm and door-opener equipment and is the approach used by VE3VXO. The mixer diode is simply mounted in the waveguide between the oscillator and the antenna. The Gunn oscillator is tuned simply by varying the supply voltage. At this point it is appropriate to note that virtually all 24 GHz equipment employs waveguide size WR42 with inside dimensions of 0. 42 by 0. 17 inches. If you are able to find a circulator, a more elegant approach is possible, which better optimizes the power going to the mixer from the oscillator and minimizes the received power which is lost in the oscillator. If a varactor-tuned Gunn oscillator is available, the modulating and tuning functions can be separated from the Gunn power supply, resulting in more optimal performance. This approach, combined with the use of a circulator is used in the Advanced Receiver Research TR24GA transceiver for which the block diagram is shown below. VE3OIK has used a varactor-tuned oscillator in a similar design, but with a straight-through mixer. When I first acquired some 24 GHz oscillator mixer units (from Kustom speed radars) I discovered that they could not be tuned more than 2 MHz using the supply voltage, and they did not have varactor tuning. Since the warm-up drift was at least 5 MHz there was no way that I could set them reliably to be the necessary 30 MHz apart to be able to communicate with each other. Therefore I adopted a wide-range tuneable IF scheme as shown below and just preset the Gunns to be about 30 MHz apart. The exact necessary IF is found by tuning the IF up-conversion oscillator. It is also worth noting that the Kustom units, occasionally found as surplus, have an unusual waveguide junction which results in transmission with one sense of circular polarization and reception on the other sense. For two such rigs to work each other one must take care to have the opposite polarization senses on the two. The only source of ready-to-operate equipment that I know of is Advanced Receiver Research in Connecticut. Their TR24GA transceiver, with a 25 mW output and a small horn antenna sells for US $699. 95. They also sell the IF receiver/modulator board separately. For the homebrewer, Advanced Receiver Research offers the microwave Gunnplexer (Gunn oscillator, mixer and circulator) for US$369. 60. SHF Microwave Parts in Indiana offers a 5 mW varactor tuned Gunn/mixer unit for US66. 00 (used by VE3OIK). 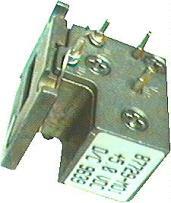 They also sell replacement Gunn and mixer diodes. Gunn/mixer units also occasionally show up as surplus (though much more rarely than the similar 10 GHz versions). VA3REI was able to acquire one Gunn/mixer unit from an alarm company, which is now in VE3VXO's rig, and I found two Kustom radar guns at Electronic Surplus Industries in Toronto. VE3OIK found pieces of a Kustom unit at the Rochester (NY) Hamfest. VE3EZP obtained a commercial point-to-point 23 GHz radio (based on similar Gunn oscillator technology) from a local ham in London and is attempting to convert it to ham use at 24 GHz. Pieces of WR42 waveguide, circulators and the like show up very occasionally at surplus stores and major ham flea markets such as Rochester and Dayton. The picture below is of the Gunn/mixer assembly from SHF Microwave Parts. Equipment for narrow band operation normally involves a transverter to downconvert receive signals and upconvert transmit signals to a lower frequency (usually 144 MHz) CW/SSB transceiver. The standard calling frequency for narrow band operating on both CW and SSB is 24. 1921 GHz so transverters are designed to provide coverage of a narrow band around this frequency. As I have not tried it yet, I will refrain from providing details of typical equipment. However, some excellent ideas can be obtained from the Kuhne Electronic website as well as articles in the German (but bilingual in English as well) publication DUBUS, many of which are available on the World Wide Web. The only manufacturer of complete transverters that I know of is Kuhne Electronic in Germany (run by DB6NT). They are represented in the US by SSB Electronic USA in Pennsylvania who offer the basic transverter for US$475. Rumour has it that it is cheaper for Canadians to buy directly from Germany. DB6NT also makes a line of low noise and power amplifiers which allow quite a sophisticated rig to be put together. There is some work needed to get it on the air; antenna transfer between receiver and transmitter and interfacing with your 2m transceiver are up to you. The majority of hams active on 24 GHz narrow band modes (worldwide) appear to be using DB6NT transverters. Parts such as transistors, capacitors and the like, needed to build the more sophisticated circuits in narrow band equipment are something of a challenge to procure for the individual. Down East Microwave in New Jersey has some parts. For local oscillators, 8 or 12 GHz phase-locked loop "brick" oscillators can be used with frequency multipliers using GaAs FETs, or diode harmonic mixers. These PLL bricks are often found at major flea markets and in surplus stores, but rarely at exactly the frequency needed, so some retuning will likely be needed. You will have to work quite hard to find everything needed to build a transverter for this band from scratch. Virtually all 24 GHz operation uses either horn or parabolic dish antennas. These are very much the same as for the lower frequency microwave bands, except that the tolerances for dimensional errors are smaller. Dish feeds always use waveguide input, a the loss in a coax feed from the back of the dish to the focus is almost always excessive (0. 7 dB per foot in 0. 141� semi-rigid cable, for example) and coaxial connectors that work at 24 GHz are hard to find. While at 10 GHz or below, the maximum dish size that can be used is usually limited by unwieldiness in the case of portable stations or tower wind loading in the case of fixed stations, at 24 GHz the difficulty in pointing the dish is often the limiting factor. VE3VXO has been using a 2 foot (60 cm) dish when portable and reports it to be very critical to point (but very effective once aimed correctly !). The figures below show the typical beamwidth and gain versus dish diameter at 24 GHz. Sources of antennas are primarily surplus stores (Electronic Surplus Industries in Toronto has supplied a number of dishes, a couple of which are in use on 24 GHz) and ham flea markets. Ku band satellite dishes should be accurate enough for 24 GHz use. Here in southern Ontario most of the wideband activity used only small horn antennas until recently. The best distance covered between two horns was 35 km (line-of-sight, from Baden Hill near Kitchener to Bower Hill near Woodstock), using about 150 mW at each end. This was, however, done in quite warm humid weather. Distances of up to about 15 km were quite easily worked. With the addition of dishes the distance has been pushed up, first to 42 km (one dish at about 10mW and one horn at 150 mW) and most recently to nearly 75 km between two dishes at 5-10 mW, between VE3VXO at Stoney Creek and VE3OIK at Star, near Caledon. This path is (barely) line of sight and was completed in March 2001, when the water vapour attenuation was quite low. The frequency stability of the wideband rigs is not very good and generally requires a hand on the tuning dial at all times. VE3OIK has added automatic frequency control to his rig so that it tracks the frequency of the received signal. This has been found to be quite worthwhile. Narrow band equipment can provide much better performance but the distance tends to be limited by the water vapour absorption. NE8I reports from Michigan that distances of more than 40 km over land, with 100mW and dishes, are quite difficult. A 100 km path across Lake Michigan has been worked but typically gives weak signals with 100mW and 1m dishes. With 800mW output and dishes, WW8M and NE8I report distances of about 60 km worked with very good signals this winter. Further a field, in Europe and California, for example, where activity and mountains are higher, longer distances are becoming quite common. Long over-water paths of 200 - 400 km have also been worked on occasion, despite the water vapour absorption. The following table summarizes a few distance records on 24 GHz. As you can see, there is plenty of scope for improving the Canadian distance record. These are the articles on amateur 24 GHz equipment and operating that I know of so far. I'm sure there are many others that I haven't found yet. "An Improved 24 GHz Diode Mount"
"A 1N26 mixer for 24 GHz"
"Control of a Gunn Oscillator by Phase Locking Techniques"
Toshihiko Takamizawa, JE1AAH, "24 GHz Transverter with HEMT's", DUBUS Issue 2, 1991, pp. 37-48 and Issue 3, 1991, pp. 24-32. Reed Fisher, W2CQH, "A Simple 24 GHz Bandpass Filter", Proceedings of Microwave Update 2001, ARRL, 2001. Joel Harrison, W5ZN, "Evaluating 23 GHz Commercial Feeds for Amateur Service", Proceedings of Microwave Update 2001, ARRL, 2001. Lars Karlsson, AA6IW/SM0CQC, "Six-Way Combiner for 24 GHz", Proceedings of Microwave Update 2001, ARRL, 2001. Barry Malowanchuk, VE4MA, and Al Ward, W5LUA, "The First 24 GHz Moonbounce QSO", Proceedings of Microwave Update 2001, ARRL, 2001. William D. McCaa, K0RZ, "Concepts and Approaches to Building 24 GHz Transverters", Proceedings of Microwave Update 2001, ARRL, 2001. Lilburn Smith, W5KQJ, "A Triband 3. 456, 10 and 24 GHz Transceiver", Proceedings of Microwave Update 2001, ARRL, 2001. Gary Lauterback, AD6FP and Lars Karlsson, AA6IW, "Dual-Band 10/24 GHz Feedhorns for Shallow Dishes", Proceedings of Microwave Update 2001, ARRL, 2001.